Channeling the winds of change like a zeitgeist weather vane. 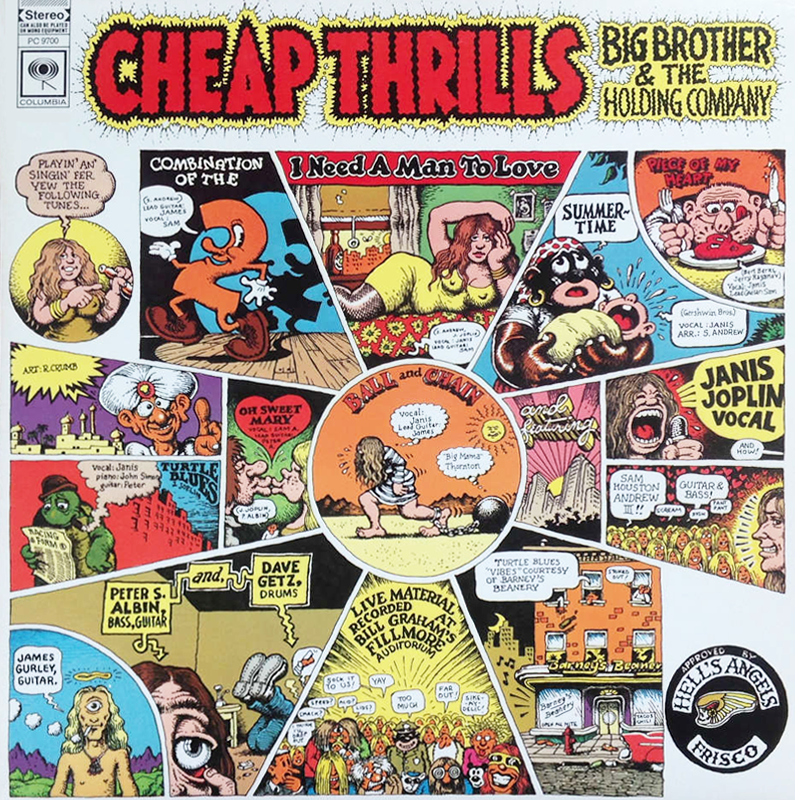 Cheap Thrills seems to have stood the test of time. It might be because it is arguably Janis Joplin’s – a great artist – greatest work. It is certainly the greatest and closest representation of what Big Brother and the Holding Company was as a band; and I would add to that argument that Big Brother/Janis Co as a band and as a SOUND was the embodiment of the San Francisco, psychedelic, Counter-culture of the 1960s. On another, more metaphorical level and in the perspective created by the distance of 50 years I see Cheap Thrills as a time capsule for the year 1968. The year 1968 might have been the moment when it all came to a boil for Big Brother, Janis and the entire, 1960s, acid-infused, reved-up-to-the-max, Counter-Culture generation. There was a beginning and an ending just within that year alone: a journey from joyousness and the thrill of arriving at the dance to the disillusionment and pain of having the party beat down by the cops. For Big Brother the year began with feelings of glory and victory: like the American Army marching into Paris at the end of WW11. We had just signed with Columbia, Albert Grossman (Bob Dylan’s manager) was managing us. We were at the crest of the wave of positive energy, the momentum of Monterey and Summer of Love in 1967 was moving east from California to the East Coast. When Big Brother arrived in New York to play the Anderson Theater in February and then to headline the opening of Bill Graham’s Fillmore East just a few weeks later it was treated like a major, musical event, covered by every newspaper and magazine. It felt like a love-fest. We started to record in NY almost immediately. The first song we recorded would be Combination of the Two. It would also be the first song on the album. Combination of the Two is about the SF ‘scene’ as seen through the eyes of a guy who is experiencing the joy and the thrill of arriving at the Fillmore or The Avalon; That’s the “Two.” I’d like to feel YOU more he boldly proposes. In early April Martin Luther King was assassinated in Memphis. We were playing at the newly opened Generation Club with BB King. I sat backstage while BB spoke softly with great passion about how people must to find a way to come together. Janis and I had watched BB from the orchestra pit below the stage when he’s opened for us in our first NY show at the Anderson. There, above us was this guy in blue tux, hair conked smooth and a 10 piece band behind him. He is totally laying it down as Janis and I are looking up at him, our jaws hanging, thinking this is the real deal and how the hell can we white, hippie punks go on after this cat. When we go out and start our first song Goin Down To Brownsville the energy is like a tornado, the place explodes and the entire audience starts running toward the stage. Summertime was approaching. We were taking a break from mixing, we were in LA now most of the time. Janis, Sam and I are in a car going west on Sunset when the radio told us that just a few miles east of us Bobby Kennedy had been shot. fifty plus years later whenever I hear this track it feels like it gets better with time. I hear it as one of Janis and Big Brother’s defining moments and arguably our highest achievement as a band. I also believe it might be one of the greatest and most original interpretations of this song. Since it’s debut in Porgy and Bess in the 1930s it had been recorded by hundreds -maybe thousands of artists in Opera, Jazz and Pop. But I’m pretty sure it had never been recorded by a rock band; especially a band like Big Brother and the Holding Co. You have to understand that in the early days of BBHC, before Janis we were very much a band about instrumental creation and experimentation. One of our signature pieces in performance was an improvisational jam that began with the theme from Hall of the Mountain King by Grieg. At the end of it James would lift his amp and bump it on the stage producing the sound of thunder. We were out there on the edge. In those days Sam was always looking for ways to inject some of his classical guitar skills into the music. He had this little Bach lick in A minor and it worked perfectly as an intro to Summertime. When Janis arrived and started singing it, it started to take shape as a complete musical journey; all the dynamics, the different textures- evolved as we played it again and again.. Of course, Janis found a way to make it her own; it was essential for her to go deep; to bring her own inner feelings to whatever she sang. When we finally got to recording it for Cheap Thrills, John Simon’s classical background and ears for detail and subtlety brought it a step further. John did something great producers do: he helped us to take what we had to a level of near perfection in the studio. It’s starts slow and quiet, just bass and drums; there is space to breathe. A guitar starts a theme with restraint and delicacy, suggesting a Bach fugue; a second guitar enters, weaving a counterpoint of two leads dancing together. Then the voice enters, a voice that tells you it has lived, been somewhere, felt its share of love and pain… In the beginning everything is looking good; the livin is easy and the cotton is high. A scene of a black woman singing to a white child is evoked as Janis takes the reins and leads us into the action with her phrasing, stretching out vowels. You are the little baby and she is telling you what this life is all about and that everything’s going to be alright. When she drops out the guitars move in and it gets busier and hotter. Sam’s guitar stays light and high. James’ Gurleys guitar gets heavy, and brutal; like the power of opposing angels duking it out. Suddenly bass and drums rise up from below, kicking and punching the rhythm relentlessly forward… Everyone has their foot to the floor as we reach a climax and crash through the clouds, free, released, floating out on a glissando, like a soft wave as Janis, this voice of longing, reemerges from the chaos and takes us to the other shore. Hammering the ‘N’ “N N N N N Nothing’s gonna harm you. Yeah, right! Summertime is a song about longing, it’s about class and race, it’s about knowing that one of these mornings it’s going to be over. It’s about the acceptance of all those things you will see. In the Summer of 1968 you will see the disparities of race and class; the police and National Guard in Chicago bashing the heads and bodies of people who want to change the world… In our rock and roll, sub-culture world you will begin to see the falling apart and the disillusionment. If Cheap Thrills, in its sequence of songs, the journey of its emotional content, mirrors the counter-culture psyche of 1968, then Summertime might be the first place in the story where disillusionment starts creeping in. I don’t know how or why Cheap Thrill’s as a time-capsule happened. We didn’t consciously think like that, but maybe as a band, as a collective mind, we were tuned in to the times. Channeling the winds of change like a zeitgeist weather vane. At the end of the Summer of 1968 Cheap Thrills is released and goes to number one on Billboard for eight weeks. Sitting down by my window looking out at the rain. Janis announces that she is leaving the band to try it on her own. In two years she will be gone. But her singing and every aspect of her incredible spirit – her greatness can be heard forever on Cheap Thrills.